Tucson Daily Photo ~: Happy Earth Day Earthlings! I thought that this interesting fellow was appropriate for today - a day about recycling and reusing things. 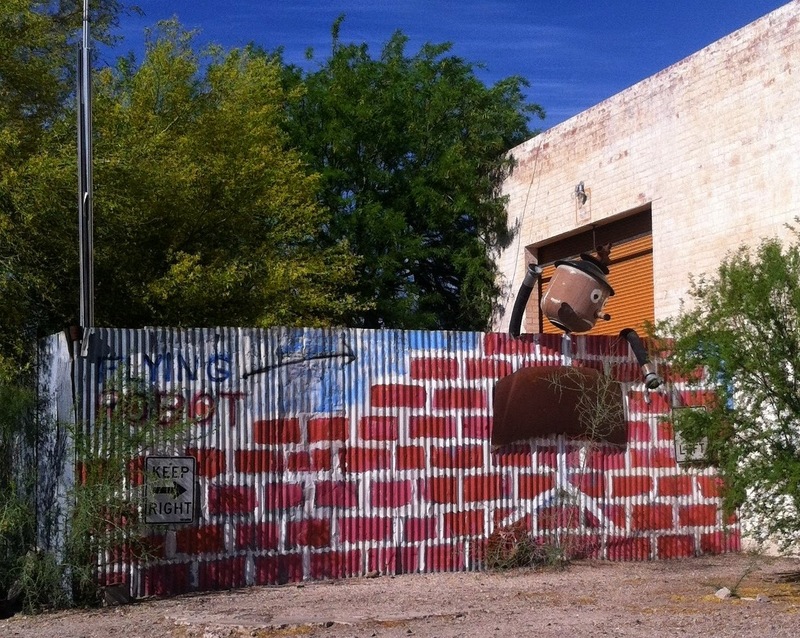 This corrugated metal fence has been painted to look like a brick wall and "Flying Robot" with an arrow points to this cross between Tin Man and Mr Potato Head! Sometimes I am amazed at the things that I find to photograph! Enjoy and have a happy day! I would like to see the GPS data on your car! Happy Earth Day fellow earthling!! NEVER leave home without a camera - a random weird thing can show up anywhere! You made me laugh by identifying this robot as Mr. Potato Head Tin Man! I don't want to see your GPS data!